It feels like a lifetime ago when I was waking up at 4am to get ready to head into the office for my sales job. Because I lived in Oregon & my territory was the East Coast, I was always the first one at my desk each morning. I actually miss getting the chance to dress up for the office – sometimes I do it anyway even though I now work from home…but it doesn’t quite feel the same. I really enjoyed putting together polished & sophisticated outfits when I was working in the corporate world and, because I know many of you do too, I thought I’d share some work to weekend looks with you today. You know how much I love shopping at Macy’s because you never have to settle for paying full price. I’ve actually done price matching with several other retailers on a few specific items and they are always the lowest! They just launched a new sale where you can get an extra 20% off fall fashion & select home items using code FALL (through 9/30). They have tons of new arrivals that I’ve been so impressed by & couldn’t wait to share with you! 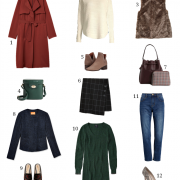 I worked hard to narrow down the best fall styles from this sale, but there were so many that I had to separate them by category below. 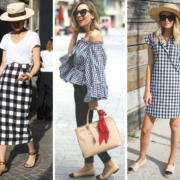 In addition to the looks I put together here, you’ll find casual staples, affordable shoes & chic handbags in the scrolling bars below – trust me when I say that these prices are phenomenal! This skirt is just the right length (I’m 5’8″ for reference) and the zipper detail gives it a cool modern feel – I would also pair this with an ivory cable knit sweater & add tights for later in the season. This lace-trim sweater is so flattering & has a slimming fit, which makes it great for tucking into skirts or high-waisted pants. If you work in a more conservative environment, try this longer length skirt & swap out the booties for classic pumps (the boots I’m wearing here also come in white & are under $50, if you’re interested in trying out that trend for less). Other work-ready styles worth checking out: this tweed skirt, this crepe moto jacket, these trousers & this wrap blouse. Because it’s still too warm out to need a coat, my weekend style usually consists of comfortable light layers. I’ll admit I was a bit skeptical when I saw the price of this sweater, but I can’t resist a good deal, so I ordered it and I was pleasantly surprised. It’s long enough to wear over ponte leggings or faux leather Spanx and it’s a great neutral color that will go with everything (it also comes in light gray). For under $15, you can’t go wrong with this one! I’m a sucker for scarves that can also double as a wrap and I was really drawn to the colors in this one (I also photographed it tied around my neck so you can see how it looks – see photos below!). Other layered looks I’d wear with jeans: this sweater blazer with this camisole, this scoop-neck tee under this plaid poncho or this cashmere sweater with this moto jacket.